Whenever two similarly themed films are announced, one is almost always rushed into production to be the first one in the marketplace. When it came to the dueling biopics about Apple co-founder Steve Jobs, one film was always going to be at a disadvantage merely due to the fact that Oscar-winning writer Aaron Sorkin was working on the other. So what choice did producer/director Joshua Michael Stern have but to get his film, Jobs, into theaters first? And more importantly, is there any chance the film was any good, so as to give Sorkin's future film a run for its money? Opening at the 2001 Apple Town Hall meeting in which Steve Jobs (Ashton Kutcher) unveiled the iPod, Jobs asserts from minute one that it has no intention of pursuing the art of telling a good story, but is rather interested in compiling a highlights reel of the life of Steve Jobs. 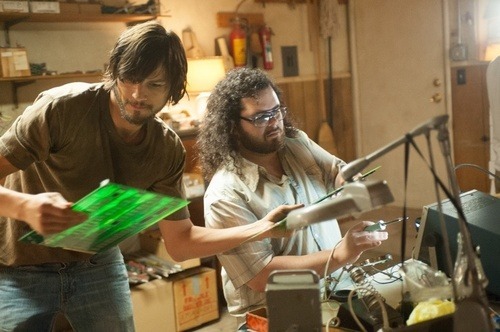 Jumping back to his early life as a college drop-out who scrapes by on his ingenuity, the film hits all his major life events from his contentious job at Atari, to his reliance on close friend Steve Wozniak (Josh Gad) to be the creator of all the ingenious ideas Jobs himself wasn't able to actualize. Jobs & Wozniak set out to sell people on the idea of a home computer, something unthinkable in the halcyon days of the late 1970s, and thanks to the investment of Mike Markkula (Dermot Mulroney) and the hard work of an assortment of their friends, they succeed in creating the Apple II, a revolution in home computing. Things begin to go south for Jobs in a hurry though, as his demanding nature causes him to rack up just as many enemies as he does allies. When Apple's board, headed by Arthur Rock (JK Simmons) insists that they bring in a CEO that has tons of real world business experience, Jobs hones in on John Sculley (Matthew Modine) the former Pepsi CEO & advertising genius, to help get the company back on track. A coup from Rock, Markkula & Sculley, however, ends up forcing Jobs out of his own company after the failure of 1984's Macintosh computer, and Steve is powerless and directionless for the first time in his life. The thing that makes Jobs such a legitimately terrible film is the fact that it is solely interested in following the standard biopic format that was so derided for so many years that most filmmakers wisely chose to abandon it. The film, while it doesn't shy away from the more unsavory aspects of Jobs' personality, is grade-A hero worship at best. The filmmakers treat every revelatory moment in his life (and there are a bunch) with the fanfare of an explorer discovering a new world. The film is full of this nonsense, and the frequency with which it swells the music and slowly zooms in on characters is such that you could be forgiven for thinking you were watching a parody of self-important biopics. You know you're in trouble almost immediately when Jobs and some friends take acid, and Steve goes from mourning his birth parents' decision to give him up for adoption to spinning around and conducting an unseen orchestra in a wheat field. I legitimately thought it was a joke, but the film has no levity or aesthetic distance with which to see how absurd many of its choices are. Every character speaks in platitudes or quippy dialogue that no one in real life spouts off without thinking long and hard about first, and the movie is never worse than in the early scenes when it treats every little thing with the awe of a child discovering a shiny object for the first time. The film never recovers however, and later in the film busts out such obvious cliches as Jobs getting so frustrated with his "garbage" walkman that he throws it in the trash. It's the kind of thing that might have happened in real life, but to put it front and center in a film is just nonsensical. What truly makes the film awful is its score by John Debney. It is full of the most egregious musical cues this side of Amistad. You'll never have to wonder what emotion you're supposed to be feeling because the directorial and musical choices will make it painfully clear how you're supposed to react. 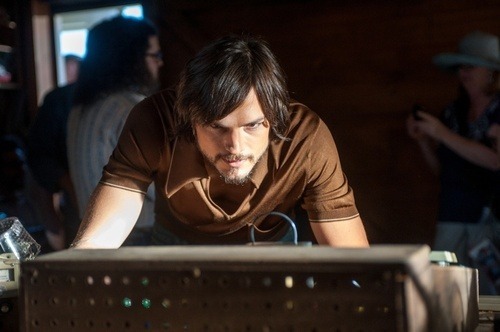 As for the 800 lb gorilla in the room, Kutcher's performance is just fine. He's not going to surprise you, but he's also not awful. He can't help but be dragged down to the film's level by a terrible script and awful directorial choices, but he's not bad. 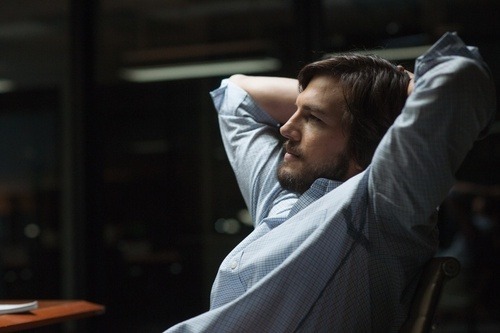 You're always aware that you're watching Ashton Kutcher, though. He never totally loses himself in the role, and he's almost more concerned with using his hands the way Jobs did or emoting in a similar fashion to the man himself than he is in giving a portrayal of a realistic human being, but he's not terrible. Josh Gad, on the other hand, is the standout in the cast. 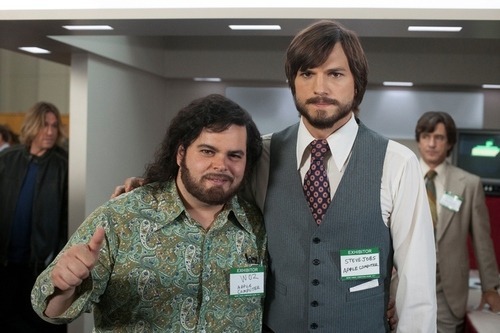 His performance is great, and even though his role late in the film is reduced to dropping by to deliver sentimental nuggets of wisdom to Jobs, his Steve Wozniak shows that the guy behind the guy is often the true genius in the room. 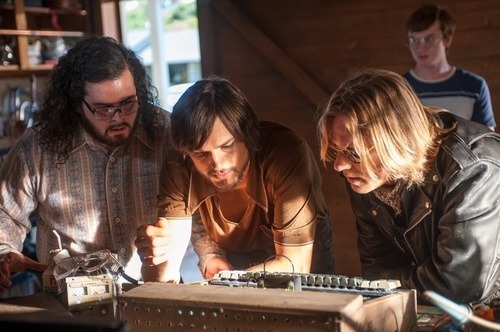 Many of the supporting actors similarly acquit themselves of the awful material they were given, in particular Simmons, Mulroney, Modine & Lukas Haas as Jobs' childhood friend Daniel Kottke. Jobs is world class dross; the kind of film that one might joke about making if they wanted to make a film so obvious and over-sentimental it wouldn't even be shown as a movie of the week on network television in the late 70s or early 80s. The film just doesn't pass muster. For a film that's about one of the true pioneers of the twentieth century, it plays out as a paint-by-numbers film so childish in its obviousness that it can't even be enjoyed as a guilty pleasure. Stern is a filmmaker better suited to working in parody because he knows exactly what all the tropes of the genre are, he just can't help falling into them and drowning. Do yourself a favor and skip this film entirely.